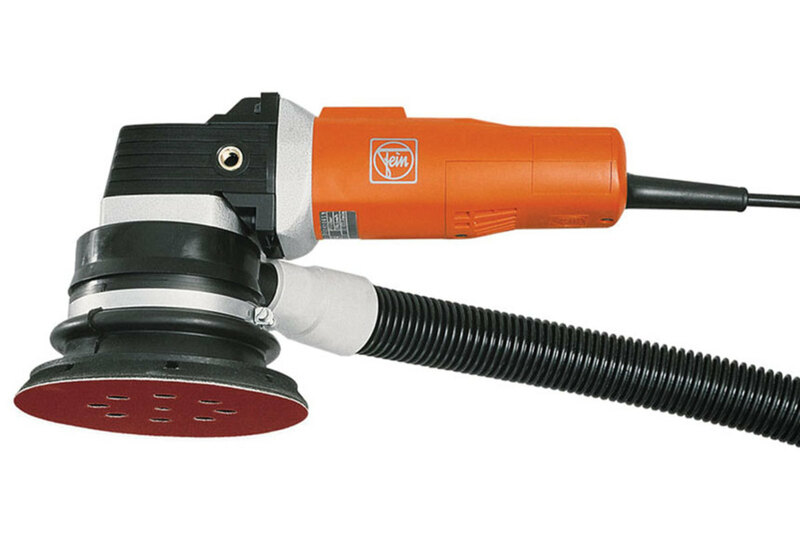 The model MSF 636-1 6” random orbit sander from Fein Power Tools. Festool (festoolusa.com), for example, has a new family of compact, hybrid, pro-grade sanders that include models RTSC 400, DTSC 400 and ETSC 125. These can run on battery or electric power. Why hybrid power? 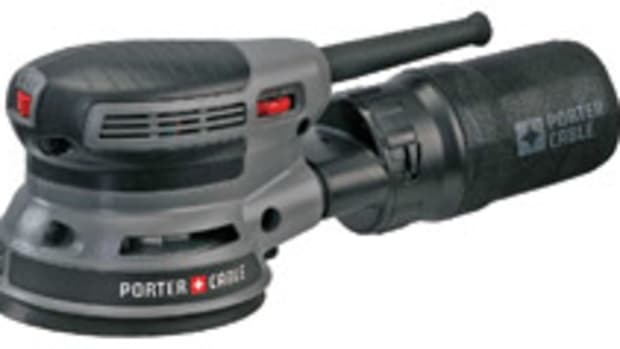 Well, woodworkers have trusted cordless drills to deliver reliably for a couple of decades now, but we’ve always been a bit skeptical about cordless sanders because of the amount of juice they burn. Drained batteries on a jobsite can be very annoying. But this new breed is different. The Festool family, and many other brands in this new generation of cordless sanders, has impressive endurance thanks to a combination of a bigger battery pack (18 volts) and state-of-the-art brushless EC-TEC motors that do the job on less fuel. The big difference with Festool is the innovative adapters so the tools can be plugged into the wall when working in less remote locations. 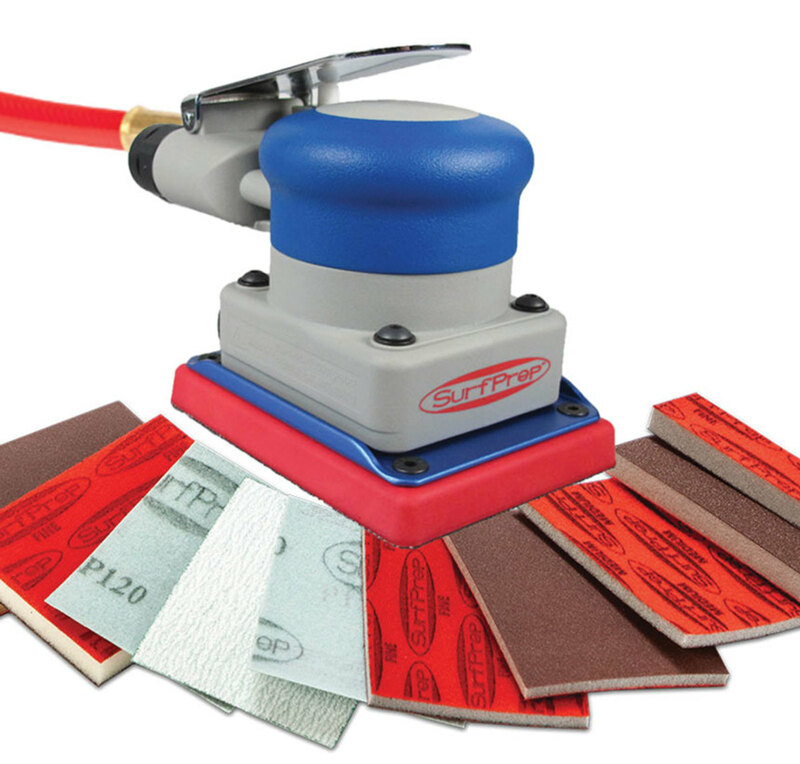 Rockwell (rockwelltools.com) also has a new pad sander, the plug-in model RK4248K with Vibrafree vibration-dampening technology. It redirects much of the tool’s energy back toward the sanding surface, thereby reducing user fatigue. And while most random-orbit sanders (ROS) have a single round pad, the RK4248K comes with an unusual two-part system that is comprised of a 5” outer abrasive ring that surrounds a separate 3” inner abrasive pad. The gap between the two contributes to the tool’s very efficient dust collection. It also comes with an adapter for connecting directly to a wet/dry vacuum. While oscillating multi-tools have been used as hand-held sanders for a long time, the new Bosch GOP12V-28 (boschtools.com) takes advantage of some tech advances to deliver a surprisingly lightweight yet powerful version. It features the next-generation Starlock 3-D interface, an accessory connection that is cupped and shaped like a bottle cap to provide more contact surface area for a rock-solid blade grip and maximum torque transfer. It has a 2.8-degree oscillating arc, and a variable-speed dial with a range of 5,000 to 20,000 oscillations per minute. Plus, the company’s exclusive Constant Response circuitry allows the tool to maintain a desired speed even as the load increases. The SurfPrep Sanding System (surfprepsanding.com) earned an AWFS Visionary Award in 2015, and while the company says it has “brought the fun” back into sanding, there might be a little room for disagreement there. Sanding can be one of the most mind-numbing tasks in the woodshop, even with these entertaining tools. 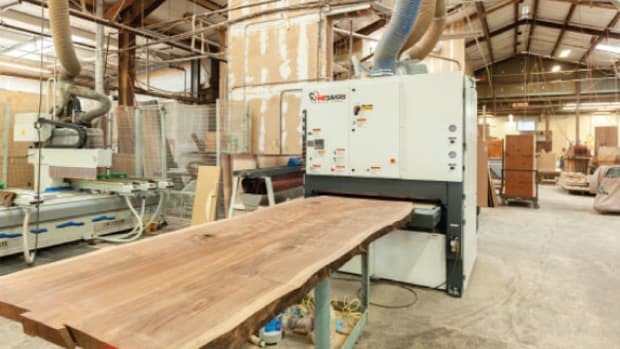 The company visited literally thousands of shops and discovered ways in which woodworkers would benefit from a larger variety of foam abrasives and accessories. The resulting products are designed to minimize physical effort and discomfort, which maximizes efficiency in production lines. Each kit comes with a SurfPrep pad sander, a 12’ air hose, variety packs of both foam and film, and some specialized accessories. Pneumatic and electric kits are available in a variety of sizes and shapes. Fein Power Tools offers the MSF 636-1, a 6” ROS with a particularly wide eccentric travel. A lot of woodshop finishes and finishing tools are born in the automotive field, and sanders are part of that history. AirVantage Tools (airvantagetools.com) is a brand owned by Prime Supply Inc. While best known for pneumatic automotive sanders, the company has also developed several electric models. Among them is the Advanced ROS line, featuring a very low profile and a grip that looks a little different than the standard woodworking tools. 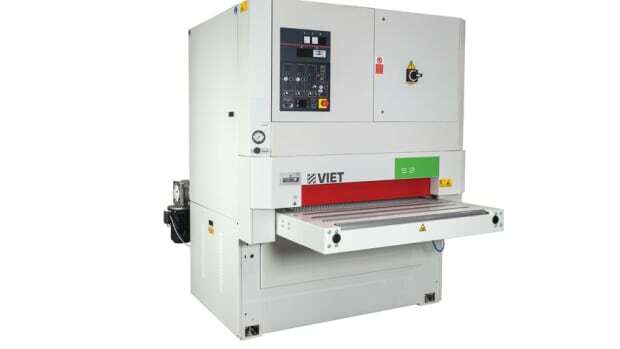 They have adjustable speed settings of 4,000, 7,000 and 10,000 rpm, and are available in 120- and 230-volt models. The company also has a 3” x 4” pad sander. AirVantage tools are designed to collect fines very efficiently and to be used all day long. Dynabrade USA (dynabrade.com) has updated several hand sanders over the past few months, including the X51 ROS. A new rotor design enhances power with less friction, and among the latest comfort updates is a recessed throttle lever that eliminates pinch and pressure points on an operator’s palm. Among the more specialized hand sanders for woodworkers are several two-handed pneumatic edge tools from Quickwood (quickwood.com). For example, the company’s F15 sander has an 8” flexible head and a pair of bullhorn handles for tackling larger surfaces. 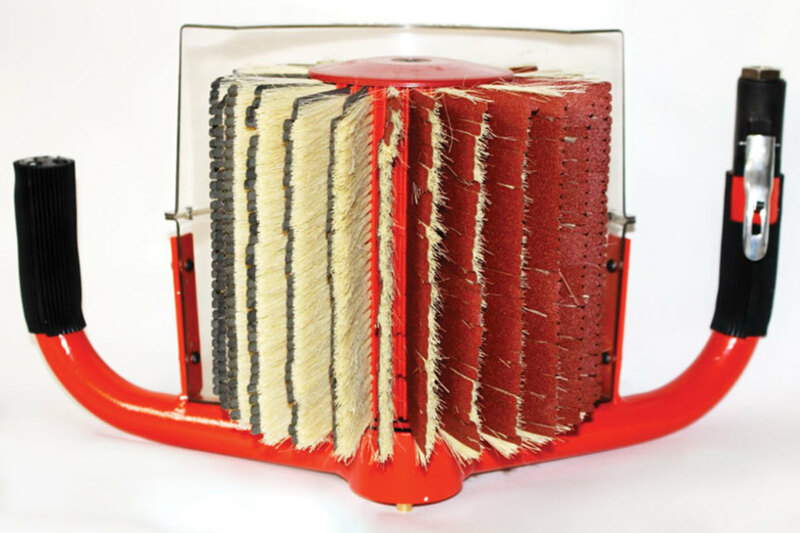 It uses brush abrasives to reach into door profiles and conform to irregular shapes. Many of Quickwood’s customers use this tool as an edge sander for doors in a stack. Mirka (mirka.com), a Finnish company with U.S. headquarters in Twinsburg, Ohio, introduced two cordless (10.8 volt) spot repair sanders, models AOS-B 130NV and 150NV, in 2017. 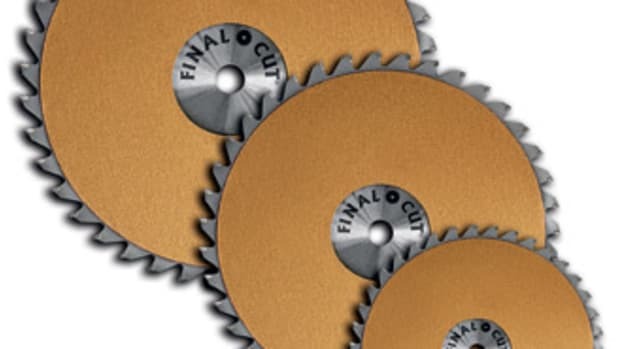 In the endless search for the perfect finish, woodworkers are always looking to upgrade their discs and belts. One of the hottest new candidates in that arena is Ekamesh from Uneeda Enterprises (sandpaper.com). 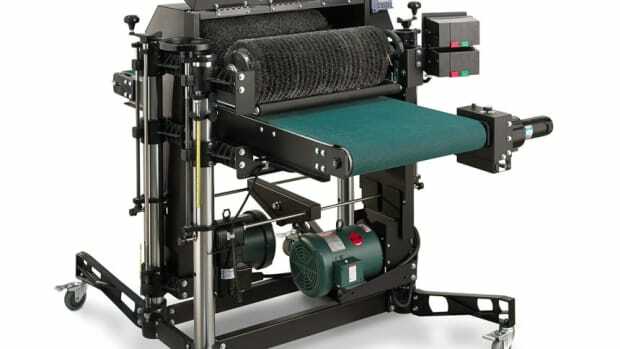 The product offers a unique net pattern that is designed to deliver a smoother finish and a dust-free environment. Ekamesh, available from Uneeda Enterprises, features a net pattern. Klingspor (klingspor.com) is a German manufacturer with offices in Hickory, N.C. 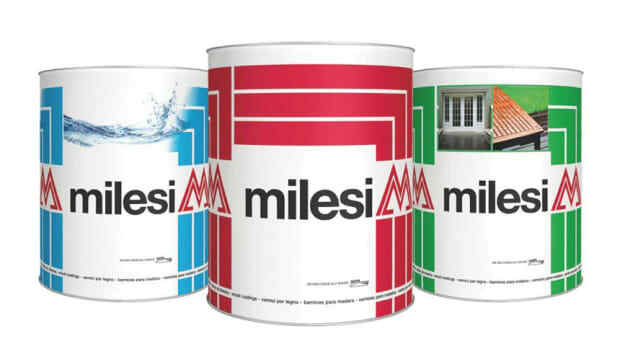 The company has been making abrasives since 1893, and has ISO 9001:2008 certification. Gator (gatorfinishing.com) is a brand that caters to both professional and DIY shops. 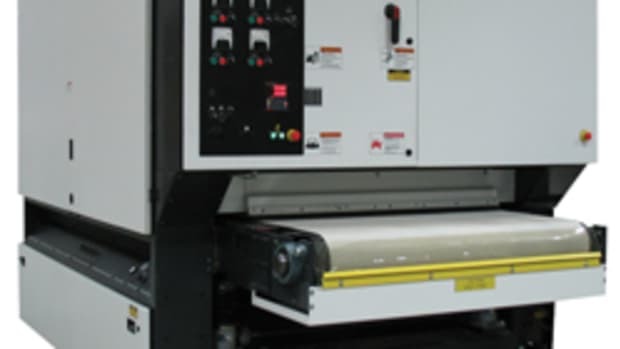 The company started as Ali Industries in an Ohio garage in 1961 and produces sandpaper sheets, fiber discs, belts, orbital sheets, abrasive rolls, ROS discs, sponges and pads, wet and dry sandpaper, and even floor abrasives. 2Sand.com is a Maryland-based coated abrasive specialist that carries sanding discs, sanding belts and sandpaper sheets. Among its newest offerings are Rhynogrip 6”, six-hole, hook-and-loop discs from the Portugese manufacturer Indasa. 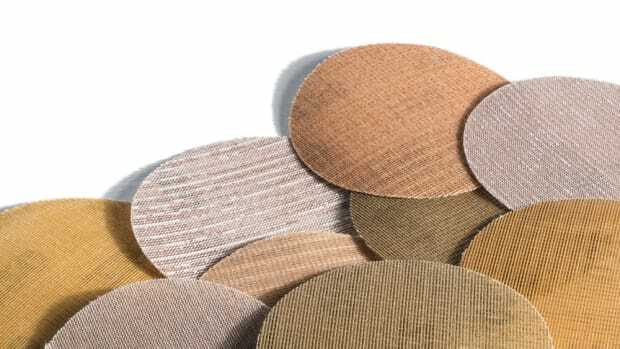 Abrasive Resource (abrasiveresource.com) supplies a selection of synthetic non-woven mesh that is impregnated with abrasive grain used by woodworkers for blending, polishing and decorative finishes. Micro-Mesh (micro-surface.com) has been around a long time and is a favorite hand sanding solution among luthiers and restorers. It can replace steel wool, rottenstone or pumice in rubbed out finishes. Running from 1,500 to 12,000 grit, it may be used on bare or finished wood and is an excellent way to spot-match finishes. It can be used wet or dry to achieve matte, satin, or high gloss finishes, and comes in sheets, discs, pads, blocks and other forms. 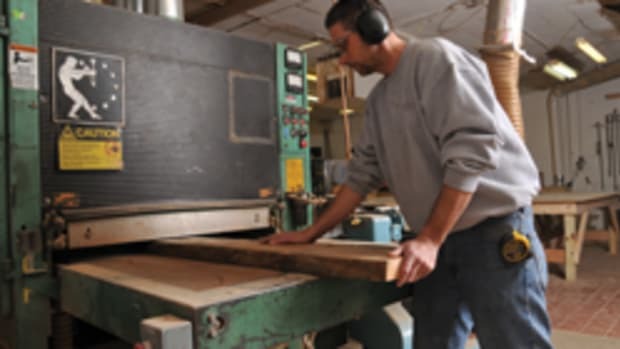 Woodworkers’ Supply (woodworker.com) operates A&H Abrasives, which can supply almost any type, shape or grit of abrasives a woodshop would ever need. 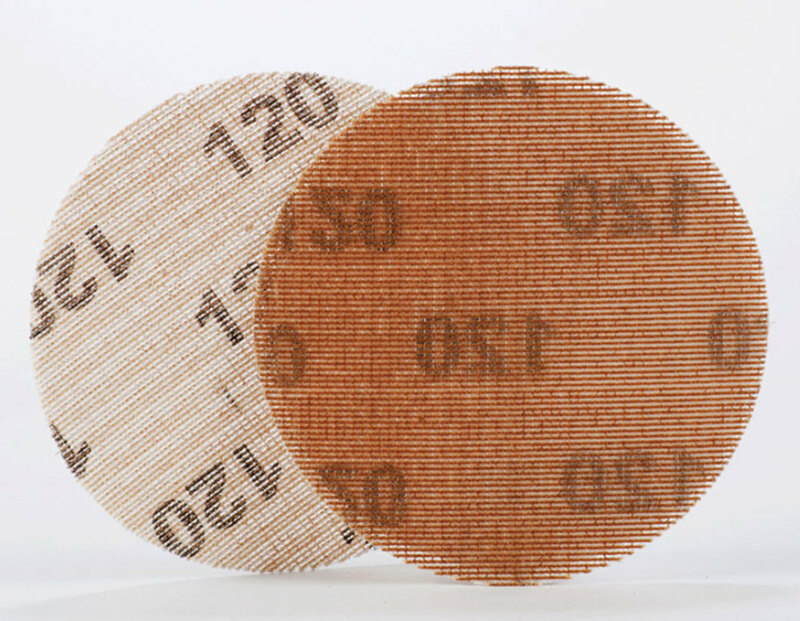 For example, A&H’s Black Max ceramic alumina discs are manufactured in Germany with a durable J-weight cloth backing for extended service life and less edge wear. For more sanding resources, visit resourceguide.woodshopnews.com and type ‘abrasives’ in the search box.